When you resign from your job via email, it's important to use a subject line that is very clear. That will help guarantee that your manager or supervisor opens your note. In an ideal world, you would send a resignation email two weeks before your planned last day with the company. But, if that's not the case, and you are giving no notice or short notice, it's especially important that your manager opens and reads your resignation email message immediately. The right subject line ensures that your manager recognizes the importance of your email and reads it right away. 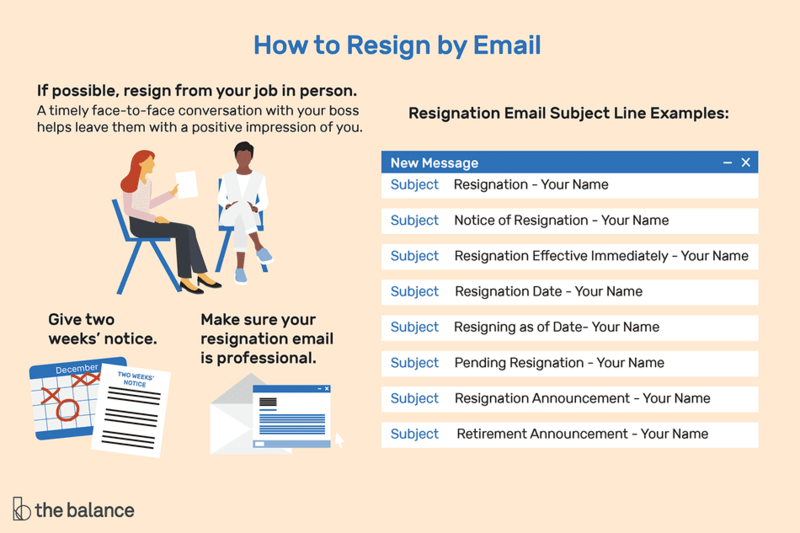 See more information below on when it's appropriate to resign over email, what to include in your note, and suggested subject lines for a resignation email. If it’s at all possible, you should resign from your job in person. Try to make an appointment with your manager for a quiet, non-stressful time, and prepare what you want to say in advance. Giving two weeks’ notice before your departure is considered standard (and may well have been required by the terms of the employment contract you signed when you were initially hired). A timely, proactive face-to-face conversation with your boss helps leave him or her with a positive impression of you as an employee. There are, however, many reasons you may prefer to resign via email. Even if you work remotely, it’s a good idea to try to speak on the phone with your manager about your resignation, but in some cases that’s just not possible. There may be an uncomfortable situation at work, your supervisor may be reachable only by email, or you may need to give immediate notice. In that case, make sure your resignation email is as professional as possible. Review these email subject line examples, as well as the advice that follows on how to resign via email. Note that each of these examples (with the exception of the retirement email) uses the word "resignation" and your name. That's intentional. With both these elements in the subject line, there's no question that your manager will miss the news — even if he or she receives hundreds of emails each day. What you write in the body of your resignation email is important, too. Begin with a formal salutation, such as "Dear Mr. Smith." Maintain a professional tone throughout, and resist the temptation to make negative comments, even if the reasons for your departure aren’t entirely positive. Remember that, if you have previously maintained a good rapport with your manager and your work performance has been strong, he or she may be willing to serve as a reference for you in the future if you leave on a good note. Be sure to include your last date of work and briefly mention why you are resigning. If you have a negative reason for leaving, use a euphemism such as "pursuing new opportunities." If you aren’t leaving immediately, it’s always good to offer to help with the transition, and/or to help train your replacement. To heighten the positive tone of your resignation announcement, express appreciation for the opportunity and the experience you gained while at the company, providing a few examples if possible. Use a professional closing, such as “Sincerely,” followed by your name and contact information. Remember that your email resignation will become part of your permanent record at the company. Make sure that it is polite, well-written, and free of grammatical and typographical errors. You should do what you can to make sure that all the paperwork in your HR file is professional and positive, from your initial application, cover letter, and resume, to your resignation letter. It is always in your best interest to leave a job on the best possible terms. You have no way of knowing when you might encounter former colleagues, or in what capacity. The last thing that you want to do is to give them reason to speak ill of you to potential or future employers. Review these resignation do's and don'ts for tips on resigning properly. I regret to inform you that I will be resigning effective March 15th. I’ve been offered a position at White and Crown and have decided to accept. I’ve enjoyed my time here, and I appreciate all that you have done for me. Without this job, I wouldn’t have learned so much about management and dealing with employees. Of course, I’ll be happy to help with any transition should you have a replacement hired before I leave. If you have any questions, please let me know and thank you again for the time here. I’m sure we’ll see each other at various professional events in the future. When you're not sure what to write in a resignation email message, review sample email messages then tailor them to fit your personal circumstances. Or, use a farewell letter template to help you write your own letter. Either way, conducting yourself politely and professionally will help ensure that you are remembered as an asset to the company.